... you will find something you may not have expected this year! Let's face the bad news first: No new HRP... yet! While there has been quite some comm activity since v5.3, it just wasn't enough to justify an updated version for the time being. We are waiting for Roma Loom to finish some additional textures to make it more worthwhile for you. No need to despair, though - we are confident that we can present a release to you early next year. In the meantime, ReaperMan got busy with voxel stuff again. After two years, he is finally coming up with the Voxel Pack v1.1 which adds new voxels for five pickups, seven switches and several props. 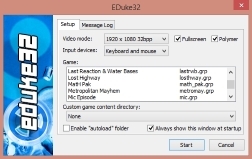 Last but not least: In my previous news, I talked about the EDuke32 Addon Pack. Well, what should I say? It's finished after working on it for over 1.5 years (with several interruptions, I admit)! At the end, 60 addons with over 670 levels (more than 1.1 GB of data) have been compiled, many of them carefully fixed and polished for smooth operation with EDuke32. You will find classics there like Last Reaction & Water Bases or The Gate just as well as recent (and excellent) releases such as Metropolitan Mayhem or Duke Hard. A heartfelt thank-you to all the mod authors I was able to contact for their kind permissions to make this possible! If you want to know more about the impressive scale of this project, just take a look at the readme file. You will realize one thing: With this, you won't get bored any time soon during the holidays! Before I forget it: You can download both the voxel and addon pack in our Download section as usual, of course. We hope you like what we stuffed into Santa's bag. On behalf of the Duke4.net Community: Merry Christmas and a Happy New Year to all of you! 2014-09-15 - Duke!Zone II: Patch happens! I have been working on something not related to the HRP for a change. Never having played Duke!Zone II, I decided to give it a try - not only in order to realize by myself that level design is quite poor at best, but there were also a few issues that really bothered me. Since I had a lot of time during my recent holidays, I took a look at the most imminent issues and created a patch for Duke!Zone II which legitimate owners of the full DZ2 groupfiles may apply. Get the DZ2 patch at the bottom of our download section if you dare. Just keep in mind that this is a non-official update created by myself and has nothing to do with its original authors, so you are doing this on your own risk. Also be sure to check the readme file for details. Other than that, I am making progress on the EDuke32 addon pack, using the grpinfo feature to enable custom mission packs to be selected via the EDuke32 launcher menu. 50 addons containing over 575 levels are currently planned to be included. Provided I can figure out some remaining issues and get release permissions from a few more authors, this could be a really neat thing for EDuke32 users. It's the best port for Duke3D after all, so it's never a bad idea to get something to feed it with, right? Stay tuned! 2014-08-28 - DukeDC HRP v1.62 - Let's undo some stuff! For a while now, I have been reading comments on Steam from Megaton Edition players, complaining about the Steam version of Duke It Out In D.C. "lacking" the changed music and green font they know from the DukeDC HRP. These modifications had always been a bit questionable since they are personal interpretations of mine, custom selections which had never been part of the addon in the first place. Therefore, I have decided to revert the current DukeDC HRP a bit: DukeDC HRP v1.62 removes the green highres menu font (it's still in the pack, but commented out in defs) and separates the previously integrated OGG soundtrack into an external pack (DukeDC HRP Music Pack) which remains available, but as an additional - optional - download. This way, I hope to avoid further misunderstandings. Anyway, the custom level ending screen (with the burning Capitol in the background) will remain for the time being since I think it's kinda cool and really fits into the game. Furthermore, I am currently in contact with James "Jimmy" Paddock who is a very capable MIDI composer for various Doom maps and episodes (e.g. "Plutonia 2"). My idea is to let him compose an all-new soundtrack for the DukeDC levels, giving them a more individual touch and avoiding any tunes known from other games, movies or TV series. Jimmy's Doom music is fantastic and he seemed quite motivated to get into Duke3D stuff for a change. Will keep you posted about progress as soon as I know more! Just a few days ago, legendary game composer Lee Jackson surprised the Duke3D fans with a MIDI release of the extended "Grabbag" main theme. Until then, the track in this form had already been available as a prerecorded CD audio track on the Duke3D Atomic installation disc. Now, at long last, we are able to also listen to the full version in our music packs without having to worry about violating any copyright issues! Therefore, the Arachno and GUS+ Music Packs have been updated to include new "Grabbag" recordings (SC-55 Pack may follow later), based on the extended version Lee has provided. Thanks a lot to him for this late, but nevertheless highly appreciated gift to the community! Half a year has passed since the last news here anyway, so what else happened? Well, we are gathering material for the next HRP release still. So far however, not too much significant content has been added (there are about five new and 40 updated textures or so). Hopefully, some motivation boost will kick in among active community members and we might get a release together again by fall or early winter. One way or the other, we intend to give you a new version again this year, sticking to our goal to issue a new HRP at least once annually. Some of you may have also noticed that the Rapidshare mirrors in our download section didn't work so well any more. Rapidshare is about to change their pricing model in July and in preparation for that, conditions for previous account owners deteriorated. Due to that, I have decided to switch to another service which will be Mega - at least for the time being. Hopefully, none of you folks will have any problems with that. 2013-12-12 - "I love the sound of Arachno in the morning..." - New Music Pack uploaded! More music is in the air, and it's nothing for the ARACHNOphobic! Anyway, you shouldn't be, as the power of the amazing Arachno soundfont has finally been discovered to create yet another variation of our various Duke Nukem 3D Music Packs which are available already. So, here it is - the Duke 3D Arachno Music Pack, normalized for your optimized ingame listening pleasure. Download and judge for yourself, it's definitely worth it! Hey there! EDuke32 team member Hendricks266 here with an update on EDuke32. You will now find that separate 7-Zip archives exist targeting "win32" and "win64"--fairly self-explanatory. You will also find that both packages contain eduke32.exe, and this is intended. "eduke64.exe" was nothing more than a placeholder file name. We're still EDuke32. You are likely to find that 64-bit builds give the Polymer renderer a bit of a performance advantage over the 32-bit builds. Once our team member Plagman has sufficient time, he will restructure Polymer to equalize and improve the performance under both architectures. However, if you are a fan of the 8-Bit Classic software renderer, you will want to stick with the 32-bit build for better performance using it instead. If you're wondering why these differences exist, hop on the EDuke32 IRC Channel and I'll be happy to give you the highly technical explanation. I hope to share further developments with you in the near future. Happy Thanksgiving to all! At long last, EDuke32 binaries for 64bit are available! While extensive testing still needs to be done to yield conclusive results, you may expect some performance improvements on 64bit systems with these, in some cases even considerable ones. Polymer users are especially encouraged and recommended to use them - in combination with the HRP, a decrease of level loading times, higher framerates and less ingame lags might be convincing arguments for giving it a try. We certainly won't mind if you do! 2013-10-05 - DukeDC HRP v1.61: Hail to the fail, baby! A glitch with the level stats screen in the latest DukeDC HRP was discovered, making it necessary to issue a hotfix release. Sorry for the mess, folks! Feel free to get the updated release over at the Download section.